The great street photographer Garry Winogrand famously stated that he took photos to see what things look like photographed. In other words, to see what the difference is between the reality in front of the lens and the record of that in the time-frozen two-dimensional print. In the genre of street photography this distinction is made clear. 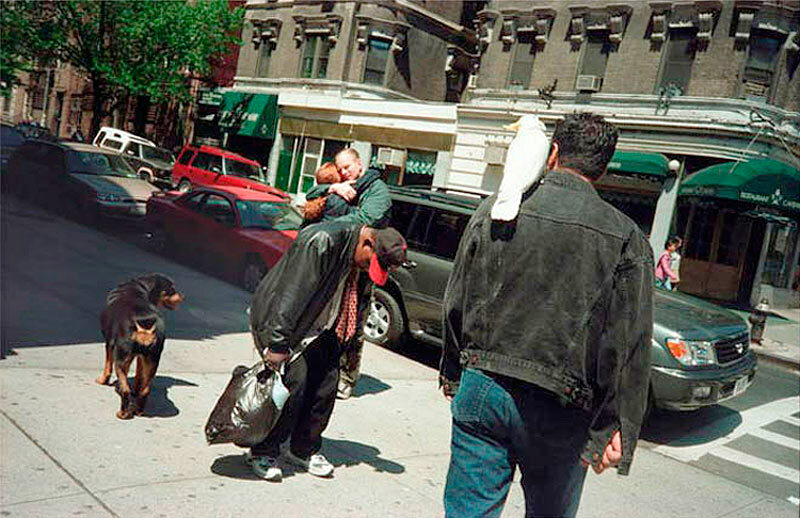 Elements that are in flux in real life – people passing on the street – are held together in a fixed relationship in the photograph. So it’s not surprising that one of the main drivers of street photography is coincidence – the fortuitous combination of fleeting events. The interest in these photographs is how they compress daily life, bringing together revealing fragments about how we live. Seeing and responding to these moments of intersection is what makes the genre so tough to master. It is a quirk of history that Cartier-Bresson was a hunter before he took up the camera because it’s the hunter’s instincts that make a good street photographer: the alertness, the sense of approaching possibility, the readiness to pounce. Let’s look at three photographs to see how the momentary combinations of subjects on the street are captured by alert picture-hunters. Melanie Einzeg (above) has captured an unlikely combination on a New York street corner. A dog looks on from the left as a couple embrace tightly. Obscuring their bodies and seeming to comment on their joy, a heroin addict on the nod freezes in mid step. To the right a tall figure looks in to the scene, echoing the dog’s gaze, while a parrot perches on his shoulder. It’s an implausible combination and Einzeg’s image is a bulls-eye of alertness and timing. The problem is, it’s not an elegant picture, the parts don’t come together in a pleasing whole. It’s literally a grab shot, a record of an event. Now look at these images by the great street photographers Winogrand and Meyerewitz and see how they form a composition out of the chaos in front of them. This takes very special reflexes plus the willingness to be completely immersed in the street. Now, they do have an advantage in shooting at public events that are dense in subject matter, but see how the elements of each shot present themselves to the camera – to you – flattened out like a frieze. 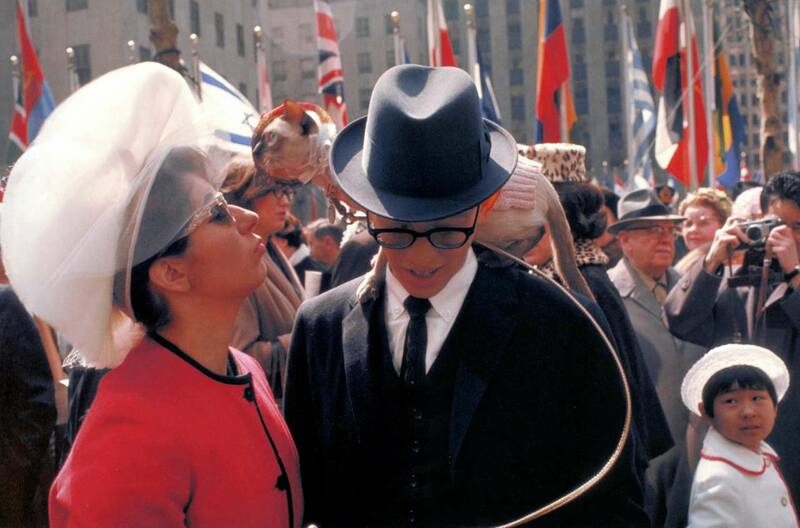 Joel Meyerowitz A woman in a white hat pouts to the cat sitting on her husband’s shoulder. She looks up, he looks down. The cat’s white lead loops around guiding the viewer’s eye. Over to the side, small a girl also in a white hat looks up at this small event, balancing the composition. Above her a photographer snaps the same subject, echoing the photographer, Joel Meyerowitz, who at this same moment is snapping the image we’re looking at. It’s a series of figure-eights, looping in and around the image. 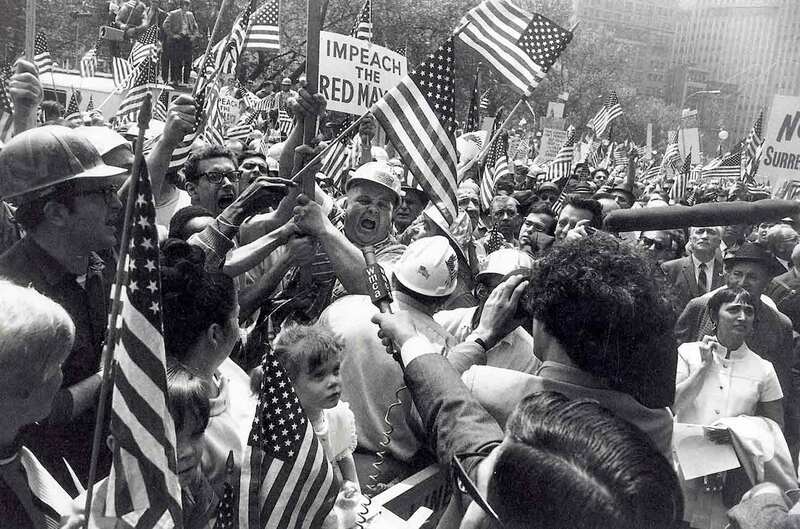 In Garry Winogrand‘s photograph of a rally in 1970, a confluence of small events builds a remarkable image of public discourse in America during the Vietnam War. A conservative blue-collar worker bellows at the media from the centre of an almost X-shaped composition. Amongst this frightening melée, a small girl looks up quizically at the press as though questioning their purpose; she’s a little piece of innocence submerged in the conflict. Over to the right, in a sort of compositional compartment, a woman in a white dress appears, lost, as though she has stumbled upon the angry scene by mistake.